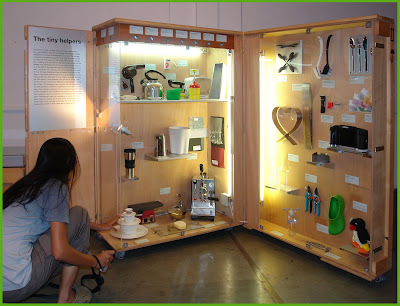 2. the tiny helpers: ubiquitous products for everyday use but with a difference, the Swiss way. 5. hip + young: youthful expression and products for the young at heart. 6. a visual statement: a slide show that presents about 300 recent works of graphic designers from various fields. and 10:30 am - 5:00 pm (Sun). Those designers and design students who missed the exhibit at NID, Ahmedabad are strongly advised to catch the earliest flight to Bangalore and make it for the show. If you are already in Bangalore you have no further excuse to miss this very special Swiss treat, all packed in six crates. Image: Criss + Cross: Swiss Design exhibition was packaged in six cases and organized in seven sections, each in wooden crates with integrated lighting and the seventh, a slide show projection system, The exhibit on the right is the “Library” of fabulous Swiss Graphic design books and on the left is the exhibit called “Small & beautiful” with several of the finest examples of Swiss fine craftsmanship from medical devices, watches to computer accessories. My personal favorite here in this section is the Kern Compass Set, which reminded me of the much bigger and elaborate professional set that was given to me for personal use when I first joined NID as a young design student in April 1969 and this did help whip up my passion for fine geometry diagrams by using some of the finest drawing instrument in the world! NID knew quality in those days and respected it to ensure that every student used the best of class in the world of drawing devices in their classes and that for me is represented by the Kern drawing instruments that was standard supply for all students joining NID in those days. Circles drawn with the Kern set did not leave gaping holes in the drawing sheets since the compass point is of hardened metal and the tip is adjustable to remain perpendicular and most of all the joints just worked and did not shake or slip due to the fine precision that came from the Swiss workmanship and their understanding of quality and design at the functional as well as the aesthetic level. There were no compromises in their product. The other remarkable exhibits in this section are the Swiss Passport which can make every citizen proud to hold one that is so distinctive and secure while the other is a commemorative edition of the Swatch which is one of four special designs offered for the 700 th anniversary of Switzerland in 1991. 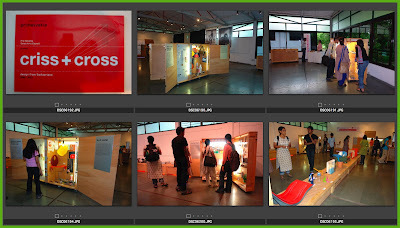 Each exhibit has a story to tell and the Criss + Cross catalogue is a useful resource that can add value to the exhibit, I have one in hand, special thanks are due to the Swiss Embassy in Mumbai which kindly spared a copy for me to review. Image: Dimple Soni, an NIID faculty and coordinator of Exhibition Design studying the exhibit detailing at the “Little Helpers” container. A finely detailed box, hinged and mounted on roller castors can be opened and mounted in a jiffy, with all the signage, lighting and exhibits in place, all in one simple case, unpretentious and elegant, just great design detailing and treatment. At the top are a row of peepholes that invite the viewer to participate, each shows one colour slide of an object and the solution is a simple 35mm slide picture viewer mounted behind the peephole that uses the glow of the lights in the box to show the slide in sharp view, a simple plastic viewer that gives us great pleasure, that many electronic gadgets would not be able to. The objects in this section are consumer and domestic products from everyday life, each designed to get the job done with minimum fuss and the objects all but become invisible to the user since they just work and the title “Little Helpers” is an appropriate label for this category of ubiquitous products of our day, all well designed. My personal favorite here is the Omega drawing pins with three legs instead of one central pin, each made by punching thin sheet metal into an embossed and therefore sturdy pin, comfortable for the thumb that could hold drawing sheets to the wooden drawing boards that we all used as students at NID in the heady days of the late 60’s of design learning under the Swiss influence that came through our Graphic Design department. In those days all our graphic design teachers had traveled to the Mecca of Graphic Design in Switzerland, the Basel School, to be tutored by none other than Armin Hofmann and his colleagues to come back and introduce the International Style in India with over 500 or more corporate logos, all designed by the Institute under this strong and durable Swiss influence over the early years of NID and its practice of design in India which I have mentioned in an earlier post on the subject.. 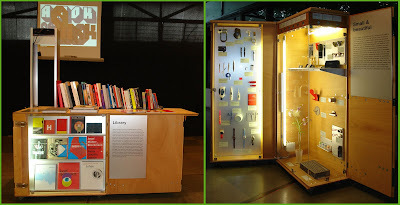 Image: Detail of two of the six cases that make up the Swiss Design exhibit. 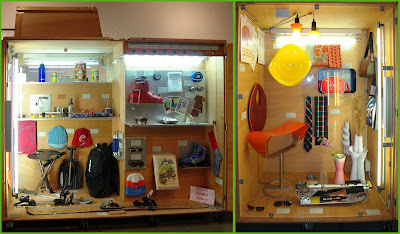 On the left is the “Up to the mountains” crate showing designs produced by the traditional wisdom of a mountain dwelling people rooted in the reality of the land. On the right is the “hip + young” crate with designs for the youthful and playful generation. Each nation around the world can boast of indigenous design solutions in their food, homes, objects as well as votive occasions and festivals, all designed through local action over the years by ordinary human actions. We too will need to look at what India has to offer as an enormous resource with our huge regional variations and long history of settled civilization. Design at this level is a product of culture and it goes to a very deep level in each refined manifestation, which may take many centuries to mature. The Swiss have learned their lessons from their mountains and these exhibits represent this deep respect for the mountain, particularly one as imposing as the Great Matterhorn, a challenge for climbers of all ages. My favorite in this section is the Avalanche dog, the Grand Saint-Bernard, a Swiss contribution to the world of specially bred and designed nature shown as a small ceramic model since the real one could not be shown. Design with nature is just as Claude Levi Straus tells us that the Mayan civilization created many of our vegetables, which were all “designed” by their careful breeding and imaginative nurture of nature in the past. In the youthful category my favorite is the Classic Micro Skate Scooter now used by adults and children alike to get around town but for me it brought back memories of my own childhood scooter from my fathers factory in Guindy, Madras when I had my very own scooter to zip around the toy factory and the vast grounds that led up to the Mount Road entrance. I will save this from another post that will link up to the Rockytoys story from my childhood days. Image: “The Longsellers” or Swiss all time classics with many exciting and famous offerings as seen from the pages of the Criss + Cross catalogue. Seen here are the famous Vitra design miniature pieces, each a precise scaled down model of a design classic produced by this remarkable design led company which also makes the original items in true and faithful detail, as specified by their designers. Max Bill’s Ulmer Stull is seen hanging at the top of the box and below it is the classic Univers font that was designed by Adrian Frutiiger another one of the NID’s great visiting teachers in the roaring 60’s. He was also responsible for the design of the famous NID symbol that is now standing at the main entrance gate as a cast in concrete negative form, which is back-lit at night to be seen from the road. Further on the shelf, is the triangular Swiss delicacy called Toblerone, my favorite chocolate, which is visible from both sides through the cut-out section in the display box. 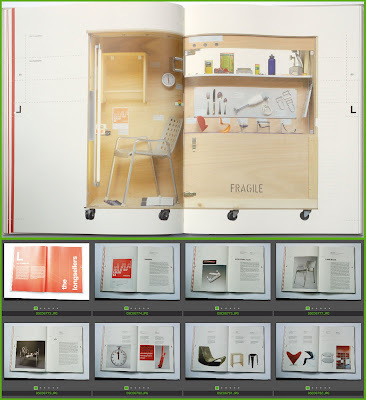 Clockwise, the thumbnail images below show – the section separator in the book, the Univers font by Adrian Frutiger in 1954, the famous Victorinox – Swiss Army Knife revised as ALOX in 1980, The Landi Stuhl by Hans Coray designed in 1938, the Le Corbusier LC1 Armchair from 1928, the Station Clock by Hans Hilfiker in 1955, the Garden Chair by Willy Guhl in 1954, Ulmer Stool by Max Bill in 1954, and Verner Panton chairs by Vitra from 1958 and 1960. For me personally many these items of furniture along with the ones that we saw frequently featured in Danish and Italian magazines in the NID library formed the impassioned introduction to design as a young student at NID in the late 60’s and early 70’s when these very designers inspired me with their work and their imagination as well as deep understanding of material and form that is represented by their classic design offerings which we now see in the Swiss design exhibit now in India for the first time. The Ulmer Stuhl is for me a very special exhibit since this was one of the remarkable products that was available as a reproduction at NID along with the box-wood filing cabinet that was used by Prof Kumar Vyas and Prof Sudha Nadkarni, both having returned from Ulm exposure in the early 60’s. I was given the filing cabinet to redesign in metal wire as my very first design assignment at NID by Rolf Misol, my German furniture design faculty when I joined NID in April 1969, but that is a story for another day. I was project guide to NID student Pradeep Shodhan way back in 1976 when he designed a Hospital Bed as part of his diploma project at the National Institute of Design and this problem that was addressed then has not gone away and I am happy to see the Onio initiative offering an alternative for the Indian market. The diploma document can be seen at the NID library but it did not reach market although it was fully developed and ready to go. In those days industry was not looking at innovations to drive the market since it was the license and control Raj that was in operation in India. Specifications was king and innovation took a back seat. I wish that NID would make these archival documents available online as digital files which is so easy nowadays. The Onio bed for Godrej looks smart and works well in an economical and ergonomic manner, congratulations team. I wish it commercial success. The bed was designed for their clients Godrej Interio, a furniture manufacturing unit of Godrej Group of companies that has been a leader in the furniture industry in India. 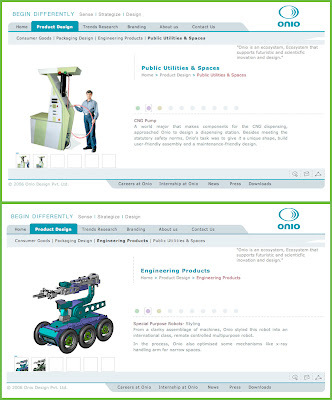 Image: Snapshots of the Onio website showing unconventional design offerings. Victor Papanek had called for an awareness of real world issues in his book titled “Design for the Real World” in the early 70’s and and much later in the mid 90’s he called for a concerted effort from designers to address environmental and ecological issues in his book “The Green Imperative”. Papanek visited NID in 1979 to attend the UNIDO-ICSID conference and I remember that the students were drawn to his ideas like flies to some sweets but the conference organisers found his views too radical to be brought centre stage at the ICSID and UNIDO agenda although this did happen much later. The Design for Development conference in 1979 gave me the opportunity to design a new auditorium chair for the NID and twenty years later this set the stage for the design of another new chair for the Ravi J Matthai Auditorium at the Indian Institute of Management in Ahmedabad which I have written about in my previous post on the Design for India blog. 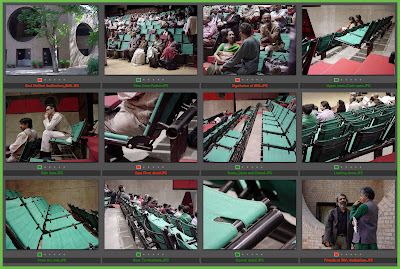 Image: Thumbnail images of the auditorium and the chairs designed by me for the Ravi J Matthai Auditorium at the Indian Institute of Management, Ahmedabad and these were taken in December 1999 during an event organized by Sam Pitroda, soon after the auditorium was commissioned. Now back to the Ravi J Matthai Chair, sorry :-), the Auditorium Chair for the RJM Auditorium at the IIMA, The story goes a long way back since in 1978 I had designed the NID Auditorium Chair to be used for the UNIDO-ICSID Conference on Design for Development. This was a real crash assignment and a crisis management effort due to the very limited time that we had to carry it out. The organisers of the conference at NID had somehow forgotten to design a chair although a new Auditorium was already under construction in late 1978 when I was brought into the picture with barely a month remaining. I was already involved in the conference efforts in another capacity in the background research and the case studies that were being assembled from the NID faculty and student experiences. In the last week of November 1978 Prof Kumar Vyas and Prof. Dashrat Patel summoned me to the venue on the NID Second Floor and asked me if I would take up the assignment of designing a new chair for the NID Auditorium to be ready for the UNIDO-ICSID conference on the 14th January 1979! We had just 45 days to conceive, design, refine, build and deliver 200 plus chairs for the NID event. I used the NID Old Auditorium Chair as a model for my own offering and the base of the chairs are made in the same manner while the upper structure is new and uses canvas for the seat and the back. This project was being offered to me because I had completed another very time critical assignment in the late 80’s for the International Airport Authority of India (IAAI) when we had designed and then fabricated 400 tandem seating system chairs which is another long story. Here the metal tube based base structure was designed by me while the FRP chair shell used was that of Charles Eames and was being offered by a firm in Madras at a very good quality and price. Gajanan Upadhaya, a faculty colleague and an ace furniture designer at NID who was designing the new staircase that would lead up to the auditorium wisely refused the assignment and it came down to me for my consideration and sleepless action. I took up the assignment under duress and on 14th January 1979 the conference opened in that auditorium and the rest is history. The chairs designed then are still in use at the NID. Dhimant Panchal who was then a student in Product Design assisted me on the task and J A Panchal was the Head of NID Workshops and he had the task of fabricating the chairs in time for the opening. The key contributor in the fabrication was the master craftsman Chaturbhai who was the then supervisor of the NID Metal Workshop and he played a major role in the jigs and fixtures that were developed to fabricate the chairs at NID as well as in the shop floor coordination and quality control in the fabrication processes. I will get back to the story of the NID Auditorium Chair in a later post but this project had laid the seeds for the IIMA assignment. Image: The Ravi J Matthai auditorium at IIMA from the outside and the inside during an event in 1999. In 1998 or thereabouts, Prof Pradeep Khandwalla, the then Director of the IIMA came to NID to meet Vikas Satwalekar the then Executive Director of NID and asked to see me since he was interested in getting a similar chair for the IIMA auditorium that was being designed by architect Anant Raje keeping in mind the fine traditions of the Louis I Kahn buildings on the IIMA campus. The NID had been appointed the architectural consultants to the IIMA way back in 1962 and it was NID who brought in the architect Louis I Kahn to provide the conceptual leadership for the project. I was fortunate to meet Khan personally on his last visit to Ahmedabad and listen to his lecture at NID in 1969. The IIMA buildings were icons that all of us looked up to and the opportunity of designing a chair for the extension auditorium on the campus was a real privilege for any designer. I accepted the assignment and with a student assistant, Shambhavi Kaul from the Furniture Design faculty, worked on the refinements on the earlier NID chair to solve several problems of mounting canvas seats that would ease maintenance issues that we faced at NID. We developed a threaded tensioning detail that was the basis of the IIMA chair and a modified mounting detail that could connect the tandem seats to the concrete floors and steps at the Anant Raje designed auditorium. Master craftsman Chaturbhai who had by then retired from service at NID and started working with a metal furniture fabricator in Ahmedabad made the prototypes. However their company did not get the final contract since it was given to a lower bid from Anukool Furniture Pvt Ltd who completed the task under our supervision. Interior environments are a direct reflection of life and time. Today’s fast changing and globalising world has brought in extensive exposure to thoughts, ideas and objects of consumption. India holds a unique position of being in the dual worlds of tradition and modernity and the cultural mooring of its people demands very context specific responses that take care of both. To resist from being swept away by such extensive inputs and to find an appropriate direction to education and practice of interior design within the Indian context, it becomes necessary to understand how this change has occurred and is occurring. Bringing together educators, scholars, subject specialists, practitioners and students, the seminar series allows to purview at one time many different perspectives and concerns related to the field of interior design, its evolution and possible future. With the first two seminars focussing on the interior design traditions in India from pre-independence to pre-liberalisation period, the seminar series has already been successful in initiating the process of increasing the awareness in the country of interior design in India from a historic perspective leading up to the contemporary times. It has also helped create a platform to bring together the divergent experiences of the professional through presentations, documentation and exhibition and promote lively discussions. The third and the last seminar in this series will focus on interior design in the period post liberalisation and in conjunction with the earlier two seminars, would position us suitably to identify the constants and variables in the development of interior design in India across time, ascertain the anchor that holds it all together and make visible that connecting thread which weaves through the exciting tradition of interior design in India. The time from 1991 onwards has been undoubtedly one of the most important for India . The liberalisation of the Indian economy paved the way for India to participate in the globalisation process in-turn allowing globalisation to influence all aspects and spheres of life directly and indirectly. Interior Design too has been much influenced by this shift with the effects of on-going liberalisation constantly changing the way lives are lived and the spaces created for it. The seminar will attempt to understand the impact that new thoughts, functions, products, technology and materials made and are still making in design thinking and the creation of interior spaces for people amidst shifting identities, cultures, values, design sensibilities, economic parities, social systems, geographies and demography. issues that play a determining role in interior design of the present day and the future we hope to create. Speakers of national and international repute have been invited to present their views on this theme. Apart from the faculties and students from the host institute, this seminar invites the heads, faculty and students of interior design and other related disciplines, interior designers and other professionals connected to the discipline and practice of interior design from all over India. Two sessions will also have the alumni of SID presenting their explorations in the world of design. The seminar will span 3 days with four sessions on each day starting at 10:00am and will go on till 6:00pm with tea and lunch breaks in between and dinner on Day01. Each session would last for 90mins with two speakers in each session and enough time for discussions. Registration will take place at the venue on the first day from 9:00am onwards. As seats are limited, prior intimation/pre-registration by e-mail would be highly appreciated. 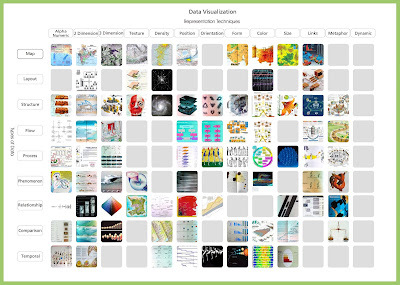 Image: Explorations to understand different types of data visualisations. Classification and Categorisation of data representation types using a bar chart metaphor. The paper quoted below was prepared in response to an invitiaton from an Indian architectural magazine for commentaries on digital design and their impact in the classrooms at NID. This invitation gave us the opportunity to reflect and share the assignments and approaches that we had developed into a course for Information Design students at NID, first at the Paldi campus and later at the new campus at Gandhinagar for the students of New Media Design (NMD), Software User Interaction Design(SUID) and Information and Digital Design (IDD). Two of these disciplines do not exist now since the Institute has decided to relocate these courses to the newer campus in Bangalore and in the process the normanclature too has undergone a change. The new discipline is now called Information & Interface Design (IID). 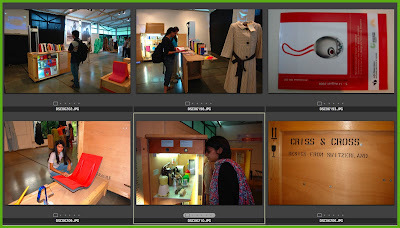 Bangalore campus also hosts two other disciplines since the last year called Design for Digital Experience (DDE) and Design for Retail Experience (DRE). This course is discussed at a blog site that was set up by the teachers to be used by faculty and students and it is called Visible Information India. Just like the other blog that is used to document our courses in a contemporaneous manner, the Design Concepts and Concerns, this one too is used to report the class explorations as they happen during the semester. The course in Data Visualisation is inspired by the books and work of Edward Tufee and Richard Saul Wurman and it draws on the work of many web based initiatives that have followed the lead provided by these thought leaders. Image: Classification and Categorisation of data representation types using a cityscape as metaphor. The areas of application will eventually cover all fields of human activity from medical images to scientific data analysis tools and in financial markets that have to support exploding data streams that are difficult to keep track of using traditional modeling and analysis tools. The human mind and our sensory mechanisms are far too overloaded by the bombardment of these data streams that we are compelled to look for new and improved ways to “See the Data” rather than just look at numbers. While plenty of data is now available through real time systems from widespread automated monitoring, making sense of this data is becoming increasingly difficult due to human limitations of perception, cognition and response action. The fields of application extend from playful ones in the area of game design as well as to life critical applications such a monitoring traffic flows in the sky and trend mapping in financial and medical situations, and the need to make sense of what we can now see and record with our available and emerging technologies. Geographic data from satellites, surveillance data from security cameras, medical data from pathology labs, home monitoring devices and investment needs of individuals through home banking all provide opportunities for new levels of visualization given the tools available to all of us. The media too has its needs for professional data managers and visualisers in mapping and modeling expressive action sequences to make current events both interesting and comprehensible to both experts and public alike. Decision makers will look for coherent presentations with visualisations of management and planning strategies and time-line models in new and complex business settings where an investment decision can make or break a company. Maps, charts, diagrams, models, statistical graphs, are all examples of visualization types that we are familiar with in today’s media and representation systems. We are entering a new area of dynamic data displays with advanced animation and representation systems that will make the reception and delivery of data several notches up the value chain and those who do it well will be at a premium position in the competitive market place of tomorrow. Image: Classification and Categorisation of data representation types using a matrix model. Data Categorization was the task that the whole group was plunged into from the very first day of engagement. 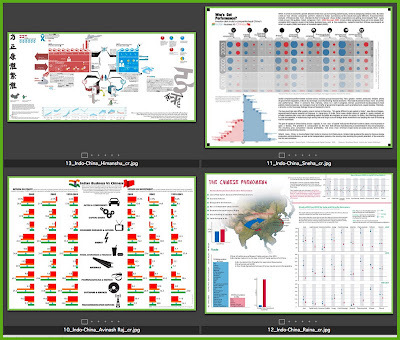 The discussions on the taxonomy of data and data visualization were followed up by a quick assignment of collection of interesting and significant examples of data visualization from the various graphics and scientific books in the NID library. Student teams were encouraged to search and supplement images and diagrams, maps and models from Internet based sources as well. Each of the groups was to try and organize the total data collected into a meaningful structure through a process of classification that would follow intuitive categories that made sense to each group respectively. They could coin terms if required and if required leave an empty slot for a missing image type that they predicted or knew existed, but did not have a prototype in hand for the assignment. They were then expected to build a composite model of their classification showing the similarities and differences between that data types that they had discovered and in this assignment they were asked to assign attributes and categories apriori and through a process of brain-storming and debate, and not to follow any one authority to justify their choices and classification. Image: Field and library research to visual model. 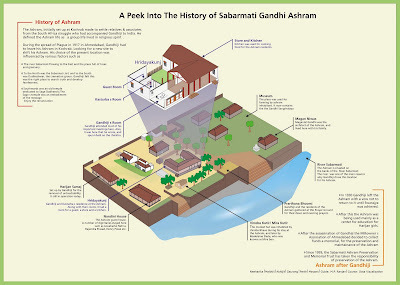 Gandhi Ashram in Ahmedabad as a case study. Image: Understanding dynamic data using visual representations and models. Mitakhali roundabout in Ahmedabad. Representing live data from the field was the topic of the next exploration. The students were required to explore different contexts and to conduct field work and visit sites to start capturing data from the field using many techniques of observation and recording. Different milieus and the locations selected included, A shopping mall in Ahmedabad, the major traffic turnabout of six roads in Ahmedabad and the Sabarmati Gandhi Ashram for Tourists and International visitors. The models were developed to suit anticipated future needs as well as match the data captured in the field from observations and recordings. Image: Modelling village aspirations and development opportunities for use by local population as well as planners. Village Sahpur study proposal. Last year we gave our students the task if selecting three small villages near the Gandhinagar campus and they were to visit the village, meet the people and try and understand their needs, aspirations and resources through direct field contact. The idea was to give them an advanced assignment in data visualisation which was complex and wicked in its form as well as structure. Based on their field research the team was required to visualise the information that was generated in a collaborative mode in one image map that could be used by the local people as well as the village administration for development oriented activities. This is village Shahpur on the banks of the Sabarmati River near Gandhinagar in Gujarat. The village was one of three that the teachers selected by looking at Google Earth and the selection was made based on both proximity to our Gandhinagar campus. 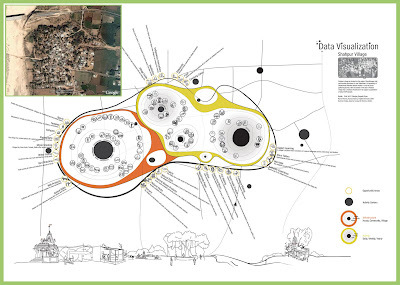 This kind of design assignment gives us many insights that could be used to solve real issues of information management on a massive scale in India which has to deal with real needs of as many as 6,50,000 villages that dot our landscape and not just the cities that are taking up all our attention today. This project was done with the students and teachers using the inspiration offered by Christopher Alexander in his great thesis, "Notes on the Synthesis of Form." Image: BusinessWeek data on Indo-China industrial competitiveness as reinterpreted by different students. Each used their own point of focus and through contextual research arrived at a unique representation in the process of sense making. 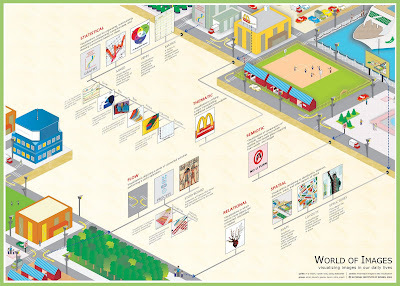 Numerous sources of stastical data provide us an opportunity to explore visual representation across many fields such as sport, economics, weather, transportation, communication and others. Students were requested to use the UNESCO data that is available from their “Institute of Statistics” data centre at their website link and examine and analyse the data from one selected predefined table for a hypothetical decision or design action. Similarly a report from the BusinessWeek on economic parameters of industry in India and China was taken up as an individual task and here the same data was showcased in different styles and intentions by the students which revealed the possibility of variety in interpretation and representation in design. This is critical in design differentiation when competing agencies are showing the same data using different editorial policies which is the case in the real world. Prof M P Ranjan and Rupesh Vyas are members of the faculty at National Institute of Design, Ahmedabad and Gandhinagar. M. P. Ranjan is a senior member of the faculty of the National Institute of Design (NID), Ahmedabad, India and Chair of the Task Force on GeoVisualization set up by the Government of India. Ranjan is highly respected in the design community as a person who has unique insights about wide range of opportunities and responsibilities that lay before designers. He has deep knowledge of design applications in high tech sector, at the same time he has pursued projects to explore potential of bamboo, and other appropriate materials. Ranjan continually explores cultural, ethical, technological, and social issues that pose intellectual challenges for the design community. Rupesh Vyas has ten years of experience in Communication Design education and professional projects. Before joining NID he was teaching at Faculty of Visual Communication, M. S. University of Baroda. He is post graduate in Visualization from the same University. He has contributed significantly to some of the major consultancy project having National importance. He is taking a lead role in developing Information and Digital Design as emerging discipline at NID. He has represented NID in different national and international forums like ICOGRADA, in Japan and in Expert Forum of traffic guiding systems by International Institute for Information Design (IIID), Vienna, Austria. He has special interest in developing innovative ways of information, interactions and interfaces in Public spaces, Location Based Information systems and Dynamic Data Visualization.